Peter Mandin is the master of Cambria, a great racer from the past that has now been restored to its original condition. Due to lack of time this interview took place via e-mail: even by telegraph there would have been no problem but you can't expect a deluge of words from someone who, with four well placed syllables in a normal voice (ready about! )*, manages to synchronise tacking with nineteen sailors and eight hundred square metres of sail! 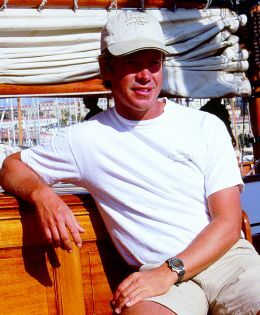 And don't let his youthful appearance fool you, in his sailing logbook, in addition to the cargo ships he captained initially, there are boats of the calibre of Adix, ex-Jessica, one of the greatest three-mast schooners in yachting and the 1912 15-metre International Class "The Lady Anne", Tuiga's sister-ship. But digging for a complete sentence from this captain, a passionate sailor and excellent skipper, we found one: "...to race aboard Cambria is a rare treat and historically speaking something of a limited edition experience!". Command experience: Cargo ships and ferries from 1989 to '95, Adix from '95 to '98, The Lady Anne in '99 and then Cambria. Current command: On Cambria, since 2000. Boat's features: It's a Fife! Which recent innovation has made the most impression on you and why: Our new Flow Doyle sail set: 5% more to the wind and 0.6 knots of speed!